Hu Y, Hu S, Wang W, et coll. Earliest evidence for commensal processes of cat domestication . Proceedings of the National Academy of Sciences of the USA 2014, 111:116-20. Vigne JD, Briois F, Zazzo A,et coll. First wave of cultivators spread to Cyprus at least 10,600y ago . Proceedings of the National Academy of Sciences of the USA 2012, 109:8445-9. Driscoll C, McDonald D, O’Brien S. From wild animals to domestic pets, an evolutionary view of domestication . Proceedings of the National Academy of Sciences of the USA 2009, 106:9971-8. Driscoll C, Menotti-Raymond M, Roca A, et coll. The Near Eastern origin of cat domestication . Science 2007, 317:519-23. Linselee V, Van Neer W, Hendrickx S.Evidence for early cat taming in Egypt . Journal of Archeological Science 2007, 34:2081-90. Vigne JD, Guilaine J, Debue K, et coll. Early taming of the cat in Cyprus . Science 2004, 304:259. Rudyard Kipling. Histoires comme ça / Just so stories. Folio bilingue, 2011. Joachim Du Bellay. Divers jeux rustiques. Poésie/Gallimard, 1996. Charles Baudelaire. Les fleurs du mal. Petits Classiques Larousse, 2011. Pascal Quignard. La suite des chats et des ânes. Presses Sorbonne Nouvelle, 2013. Rudyard Kipling. 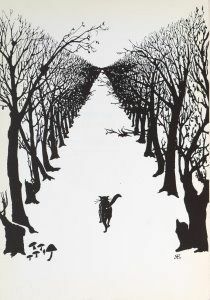 Le chat qui allait son chemin tout seul .In : Histoires comme ça . "Le chat qui s'en va tout seul" de Rudyard Kipling, traduction de Robert d'Humieres et de Louis Fabulet, e xtrait de l'Oeuvre radiophonique diffusée sur France Culture en août 1997.Acteurs : Anne Alvaro, Pascal Nzonzi, Christian Pelissier, Mouss, Francoise Henry-Cumer, Yves Gerbaulet, Malek Kateb | Bruiteur : Dominique Aubert.